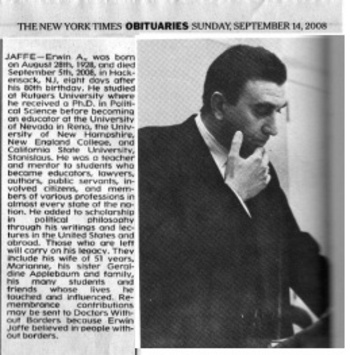 We've been quite sad here for the past days since the death of Dr. Erwin A. Jaffe, professor, mentor, friend, protector, and door-opener for my husband. Jeff has written a lovely tribute at the website he set up for Erwin some months ago. Erwin wanted to put all of his important thinking in one place on the web, the beginning of which is what you'll find by clicking. Over the past year, we were able to spend time with Erwin and his wife, Marianne, his other half for 51 years, as he was treated every six weeks at Mass General Hospital here in Boston. We cherish those times, particularly the very first one, last December, when Erwin called to let us know they were here - and a whole slew of his students from many years past crammed into their hotel room. An impromptu party with all of us sitting on the beds, Erwin regaling us with stories, people catching up with one another. These moments flash briefly in our lives, unplanned and full of memories, love, and life. Please look at what Jeff has written. And if you teach, be like Erwin and never stop being part of your students' lives. I love the closing to the piece below, asking people to make donations in his name to "Doctors Without Borders because Erwin Jaffe believed in people without borders." Copenhagen, the play by Michael Frayn, got a long Louise Kennedy review in today's Boston Globe. I've been waiting since we saw it this past Wednesday. A.R.T. in Cambridge, Mass., which is staging the play until Feb 3, is a stunning space - you walk in on the stage floor, seating stadium style on sides, and "in front," the many tiers that face the set. In this case, being seated on the side seemed an advantage. The play requires thinking from many perspectives and having to watch from an oblique vantage is conceptually fitting. "The set:" Three large oval light tracks arced at odd angles to one another circle the ceiling. "Electrons" whip around at various intervals, flick on at different times during the performance. Mirrors along the back wall are the stage design; the set comprises three chairs that the characters move around the stage. That's it. Characters: Three - 1. Niels Bohr (Will LeBow), the Danish physicist who proposed "complementarity," the principle that says, in essence, you can't have black without white - in physics, his theory is connected with waves and particles - one can't exist without the other; 2. Margrethe Bohr (Karen MacDonald), wife of same, mother of six sons (one of whose deaths provides a refrain in the play), typist of manuscripts, and the character who translates physics into English - and humanity - on the stage; and 3. Werner Heisenberg (John Kuntz), the German physicist whose name precedes "uncertainty principle," meaning that once you start studying something, your intervention so changes what you're studying that it's not the same thing as when you started. Plot: In 1941, Heisenberg arrives in Copenhagen for a meeting with Bohr. "Why did you come to Copenhagen?" Margrethe repeats this line many times in the play. It's the central question that allows the characters to reflect on their lives (when the play opens they're all dead; everything is a flashback), explore physics, argue about collaborating with the Nazis, hint at the nuclear bomb projects underway in both Germany and the US, mourn, walk away, come back, and love one another - even as they all have different memories of how those discussions transpired. The characters play their parts in relationship to one another and comment to the audience, the work of narration passing among them as they discuss ethics, science, families, politics, the Nazis, love, skiing, Norway, walking, babies, anti-semitism, Einstein, drowning, each with its complement, each uncertain. Powerful, powerful. Complementarity has been a big topic in our house since hubby Jeff used it as one of two core principles (the other was level structure) underlying "human systems theory" in his dissertation. Thus, the play picked up a lot of threads we've talked about. I kept wishing I had the script in my lap as the ideas are heady, worth thinking about at a slower pace. An editor friend whom we went with said she wished she could have had at the script - would have removed a third of the lines she said. I can understand this. The sheer complexity of the material might be easier to comprehend if the acts were shorter. In one sense, it's a really long lecture about the most abstract of ideas. Thank you indeed for the wonderful experience of seeing this different Copenhagen performance. As you know, we have been guests at a number of performances since the NY opening in 2000, and I have had the burdensome opportunity to become a participant in those symposia that dealt with the controversy arising out of this play. What was so refreshing this time was the fact that the play was allowed to be a drama on many levels and that the one-dimensional, contentious aspects did not dominate the many-layered personal story. "The studio of my mind"
She lived for thirteen years after tests confirmed ovarian cancer, which she intuited long before that. She opened her sealed orders early, knew she was meant to dance, which she did until two days before she died on April 6, 2007. Last night, two hundred members of Dorothy Hershkowitz's family celebrated her life. Sweet nibbles to welcome guests and then the curtain. A forty-minute film that Dorothy narrates, a dance biography, with Dorothy looking to the filmmaker, Lynn Bikofsky, and talking to us. Dance has been her "best friend," she says (at her funeral last April, the cantor recalled her saying that dance was her "conversation with God"). When things have been difficult, which they often were (we remember), she goes to her studio or at least "the studio of my mind." Dance is where she works out life, realizes emotion, travels through space. We see clips of her as a very young dancer, and, remarkably, pieces of her major early works, Kaddish, which she choreographed and performed shortly after her father's death (I made seafood lasagna for the cast party), and Monday Morning Quarterback, inspired by an incident where she had to step over a drunk in a subway turnstile. She is still dancing at the end of the film: she had to repeat a take 30 times, 30, when she performs in the halls, not the auditorium, of Dana Farber Cancer Institute, because people keep walking into frame, the background narration a lab technician saying "some people enjoy this test, find it relaxing," as Dorothy throws her body, just a few months before her death, from wall to wall with the knocks of the MRI. And then her teaching one of her last classes, frail, close to the end, her arms floating like no others, and the camera rests on her smile, her very beautiful smile. People speak, beginning with the cantor, Lorel Zar-Kessler, and then many others. Poems, anecdotes, quotes from letters, a cello concert, cards, and emails Dorothy wrote, Dorothy-aware of death coming soon, her son, Alexander Bohn, recalling that she danced when she put away groceries, her students, her best friend in junior high, her cousin, all recalling a Dorothy the others recognized, and the brave tall man who said Dorothy was his icon of hope after his wife's ovarian cancer diagnosis because D had already lived seven years, (and, as it turned out, did live four years more after his wife died). 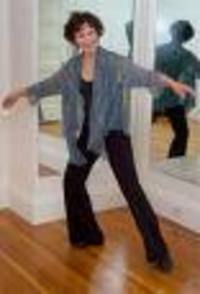 Surely, as her husband, Dave Evans, has said, her incredibly strong body, all those years of movement, extended her life. And then they danced, 15 of her students, in a piece choreographed by Joanie Block to "Smile." Dave said the last words. Gratitude to all, composed and dignified, and very lovingly he tells of two things Dorothy said, the first a few moments after they met: "She poured out her love, meaning Alexander and Jonathan, her sons;" and her last, to the effect of: "No one should go hungry - there is no reason for that." And then we all sang "You gotta have heart," words on the jump page here. Repeating what I wrote when she died: Dance on, Dorothy. A nice article in the Newton, Mass, newspaper where Dorothy lived. Grace Paley (1922-2007): "Art is too long, life is too short"
Almost ten summers ago, I attended Richard McCann's autobiography-to-fiction workshop at the Fine Arts Work Center in Provincetown, Massachusetts (USA). Many times since, I've heard Richard in my head, quoting Grace Paley: Write in the language of your block. Grace died of breast cancer at 84 yesterday in Thetford, Vermont. Die in the Internet age and much info about you comes together so quickly. Thus it's easy to find Grace's writing, what others think of her work, what she said about herself, even listen to her read. Several focus on her output, not commensurate with her power, they imply. About this, she says in one of the NPR interviews, "I tend to think of my life as one thing. I'm a writer, a teacher, a political activist, a family person, and I hang out a lot and all take time. I probably short-change all of them. I don't write enough, teach enough, hang out with my family enough." Maybe not enough but eternal. Heard her phrasing of what Richard described: "Write in the language of your streets and the ordinary language of your time." IMHO, fine advc 4 2day's wrtrs. A deep NY Times obit from Margalit Fox (who also wrote Carolyn Goodman's and Liam Rector's). She thought well of gossip, a form of story-telling in her view, commending same in men: "A good male gossip is a good person." NY Times review of one of her books from 2004 here. Very good pieces at NPR with quotes from Robert Pinsky (who once helped me change a tire) and an interview with Susan Stamberg. "My Father Addresses Me with the Facts of Old Age," short story, New Yorker, June 17, 2002. "A Walk in March," poem, New Yorker, May 28, 2007.